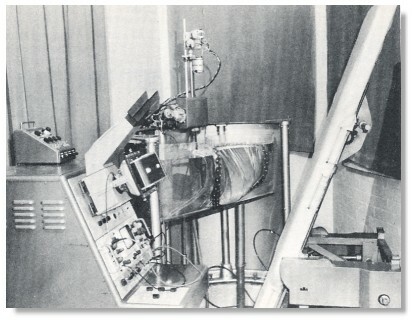 The CAL echoscope (Mark 1) in the early 1960s. The coupling tank is seen in the middle and on the right is the tilting stretcher used to position the patient to place the long axis of the gravid uterus perpendicular to the scanning beam. The Mark 2 was developed after 1969. The typical sonogram without gray scale at that time. 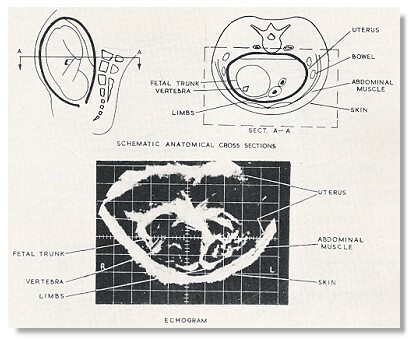 From "Two dimensional ultrasonography in Obstetrics" by George Kossoff, David Robinson and William Garrett, presented at the First Internation Conference on Diagnostic Ultrasound held in Pittsburg, Pennsylvania in 1965.